As I wandered through Hadramout in 2010, traveling between Sayoun, Tarim, Dawan, Sah and Shabam, I encountered an unusual, deep green tree, dense and wide. I was told it was the sesbania, and later discovered that it is a deadly plant species. Further on during my travels through the governorates of the republic, from Amran to Dhamar, Hodeidah, Aden, Lahj, Dalea and others, I noticed the concentration of sesbania trees on the roads and in farmlands. However, despite its prevalence, this widespread tree is not economically viable. It does not produce fruits that can be readily sold on the market. And although its leaves, pods and flowers have a high protein content, they are scarcely benefited from because of their acrid and bitter taste. I am yet to find a plant that competes with sesbania in its extent and abundance, other than qat. Sesbania occupies the space of palm trees in Hadramout Valley, vegetables in highlands and valleys, and fruits in Tihama. As a result of its ability to spread its roots and absorb deeper ground water, wherever it grows, its neighboring trees tend to be pale green and almost dry. To make matters worse, if the space is limited, the presence of the sesbania is lethal to other trees. 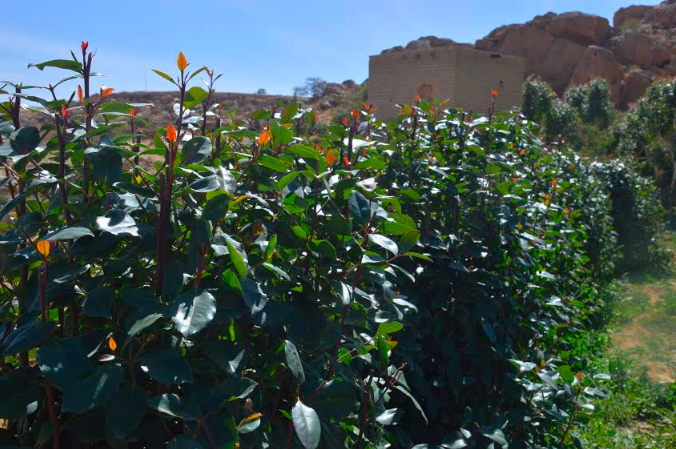 Farmers in Hadramout have tried to combat this creeping tree but were unable to keep up with its fast growth. It has an ability to grow everywhere, including farmlands, rocky roads, arid plateaus, house gardens and motorways. If you uproot one, you will be surprised that dozens have sprouted underneath. It produces a large number of roots that spread everywhere, as if avenging the attempt to uproot them. Sesbania trees are capable of reproducing with one seed, a root residue, or fiber remains in the droppings of animals that consume their leaves. Their destructive capacity also affects houses. Often they multiply in sewers and block the passage of water, which leads to the flooding and destruction of residential areas. In the past, the government, alongside international organizations, has made several attempts to uproot sesbania trees. However, given its exceptional ability to reproduce against all odds, these efforts have been costly and unsuccessful. 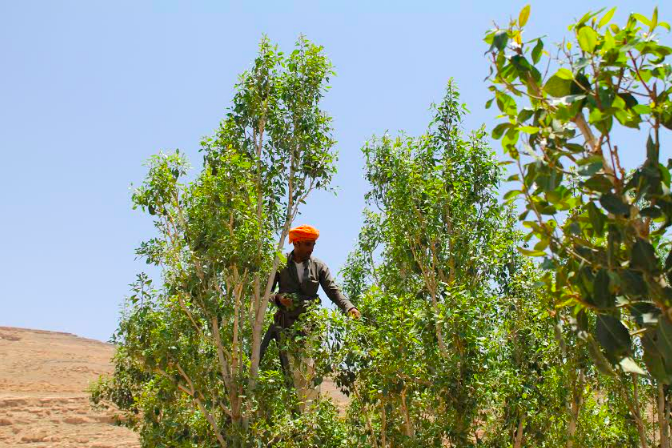 So how did the sesbania tree land in Yemen? The tree is originally native to tropical Africa. It is said that an unknown British colonial engineer decided to bring the tree to Aden to counter sand encroachment in southern Yemen. No studies of either the nature of the tree or the local climate conditions were conducted prior to the introduction of the tree. This meant that its ability to creep up and occupy green spaces and its incredible capacity to reproduce were unknown. Eventually, sesbania trees prevented sand encroachment; but they then encroached on everything else. Undoubtedly, sesbania’s connection to colonialism in Yemen adds a dark shadow to the legendary history of the tree. Similarly, it is said that ravens are not native to the Yemeni environment. If you visit Aden, you will find that the raven is the dominant bird in the sky because it kills all other birds in the same manner as the sesbania tree. This is also the case with the qat tree. Qat is another deadly tree in Yemen. Like the sesbania, it came to Yemen from Africa, but 500 years ago. If the historical accounts are true, qat was first introduced to Yemen through the Sufis in Aden or in Taiz through Mokha port. However, the difference between qat and sesbania is that sesbania spreads unsystematically and without human intervention. Meanwhile, qat takes over farmland areas that were once planted with coffee, grapes and grains, with the aid of a systematic human intervention whose sole purpose is material gain. Qat has come to dominate all aspects of Yemeni life. The consumption of qat is no longer purely a drug issue, such as in Kenya and Ethiopia, where qat is also consumed. 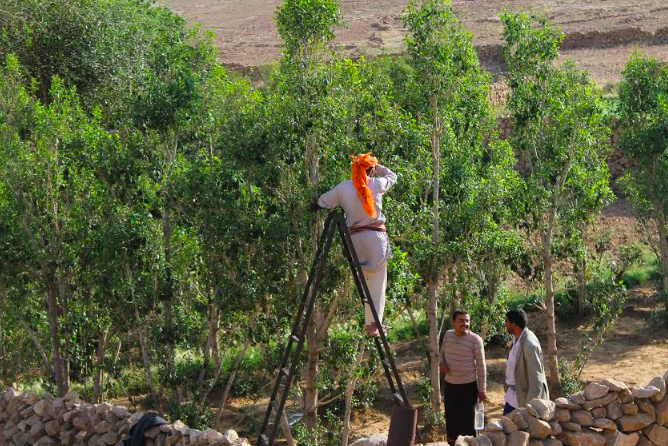 In Yemen qat has become a lifestyle that shapes the daily life of Yemenis. The day comes to an end at 1.00pm, when the consumption of the drug starts, and continues to adapt to qat consumption throughout the night. It is also prevalent at weddings, funerals, family and friend gatherings, cultural meetings and political forums. The most sensitive political decisions are taken under the influence of this harmful plant. In fact, qat has a great influence on Yemen’s cultural and intellectual scene. It has slowly reshaped the concepts and forms of culture to fit its mold. In the past few years, there has been a trend of ‘Theater in Qat Gatherings’. It was an idea put forward by an Iraqi intellectual, who at the time was living in Yemen. Theatre was refashioned and presented in the confines of the remaining center space of the qat consumers’ gathering hall. This move was supported by a well-known intellectual figure, Dr. Abdul Aziz al-Maqaleh, in response to both culture and society. But qat, rather than attracting addicts out of their dark and cluttered gatherings to public theaters, succeeded in drawing culture into its narrow sphere. It is also important to note that qat gatherings are gender segregated due to space limitations and the effects of the drug. Taking this practice into consideration, qat has limited culture to men only and excluded women from all cultural activities. Qat consumption became the main activity in cultural forums that were once run by highly esteemed intellectuals. Qat culture forums excluded female qat consumers, youth and all non-consuming members of society. On top of that, the consumption of qat has become a condition for literary production. A poet or writer is often unable to write without being under the influence of qat. Perhaps this explains the phenomenon of the sudden appearance and disappearance of writers in Yemen. Once a poet, a playwright or a novelist emerges, they suddenly disappear after excessive qat consumption takes them into an endless creative block. The issue of qat has been portrayed in the writings of Yemeni literary pioneers, from Muhammad Ali Luqman to Sheikh al-Bayhani to Muhammad Mahmoud al-Zubairi, all of whom believed that progress in Yemen is directly linked to eliminating the qat epidemic. However, soon after, the fight against qat slowly disappeared from the intellectual discourse of later writers. Instead, a pro-qat rhetoric emerged and Yemeni intellectuals became amongst the most avid promoters of the national drug. All with much disregard to its destruction of the human mind and body, as well as its impact on soil, draining of groundwater, takeover of agricultural food products and threat to the food security of the country. “If Freudians say that sexual energy is the primary motivation behind all human behavior, and Marxists say that economics is the driving force of history and civilizations, we Yemenis can say that the qat tree is the ruler and governing force of the life of the Arab people in Yemen, and even exerts control on economics, energy and sexual drives. Al-Zubairi was not exaggerating. I found nothing similar to qat except heroin in Afghanistan and opium in China before the Cultural Revolution. Still, qat is more dangerous because it is not just a drug but also a way of living. It surrounds the Yemeni consumer from the first waking hour to the last, and continues to pursue him through dreams. Even following his death, qat has succeeded in turning funerals into an occasion for its consumption, with people falling into a cycle of numbness and unconsciousness. These two trees that are alien to Yemen are killing other trees, farms and people, and creeping up on all the positive and magnificent aspects of the country. I do not want to talk about politics in a magazine dedicated to culture, but the advance of qat and sesbania reminds me of other green and black advances that have raised banners of terror and death in this beautiful country.